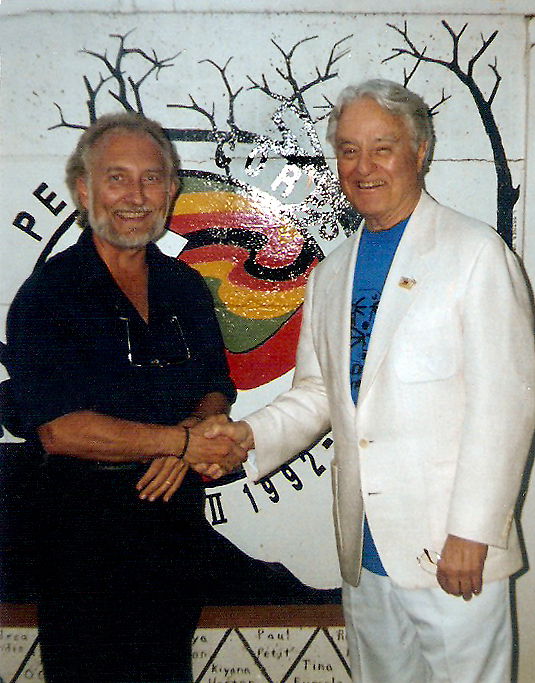 Tommy R. Chambers began Peace Corps Training on October 19, 1992 at the Peace Corps Training Center in Chitungwiza, Zimbabwe, and completed an intensive six-week program. The training included Cross Cultural Studies, Shona Language and Personal Health. Mr. Chambers continued two more weeks of personal training/familiarization on-site at cultural institutions throughout Zimbabwe, and he began his Primary Assignment on December 15, 1992. Mr. Chambers was enrolled as a Peace Corps Volunteer on December 6, 1992. 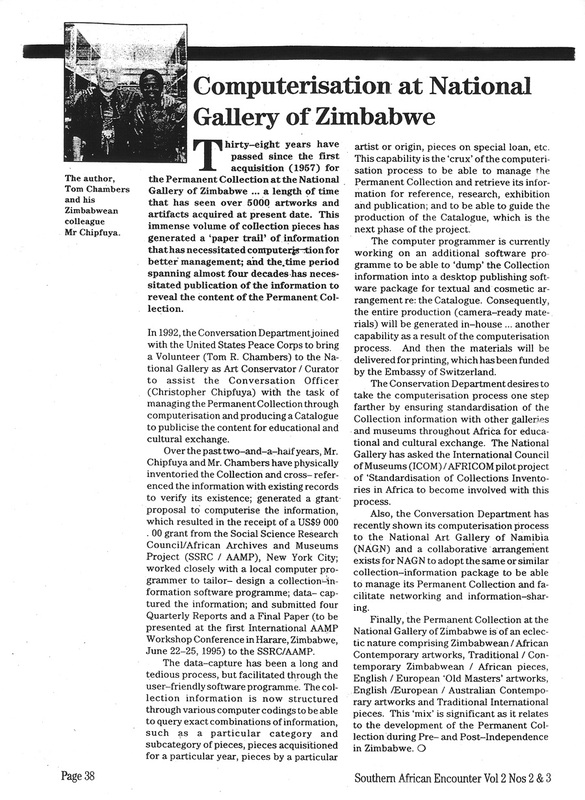 Assigned to the Ministry of Recreation, Sports and Culture, he was posted as a Curator at the National Gallery of Zimbabwe to produce a Permanent Collection Catalogue. 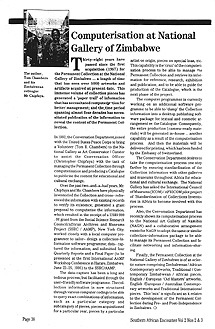 His responsibilities included research/classification; computerization (he wrote a grant proposal to computerize the Permanent Collection information for which he received US$9000.00 from the Social Science Research Council/African Archives and Museums Project, New York City); in-house layout/design of the Catalogue (via Aldus Pagemaker); and computerization/curatorial training of National Gallery staff with regard to the Permanent Collection. He also prepared/curated numerous exhibitions from the Permanent Collection for public cultural enhancement and education; researched/re-configured the Traditional African Permanent Display Gallery; and generated National Gallery involvement with ICOM/AFRICOM to standardize the computerization of the Permanent Collection information to conform with computerized collections information throughout Africa for cultural exchange and protection of African Heritage. As a visual artist, Mr. 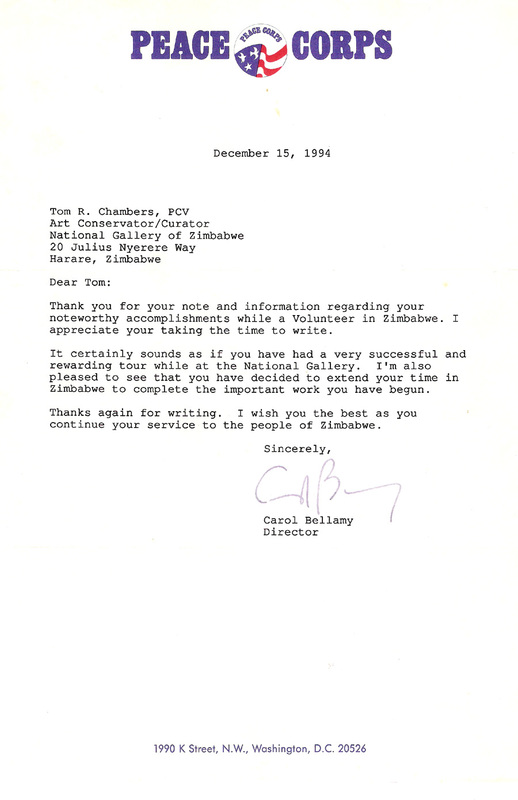 Chambers was invited by the National Gallery to exhibit a series of conceptual photographic images, Variations on the Dan Mask, to offer his interpretation of the Traditional African mask form; and the exhibition was officially opened in December 1995 by the United States Ambassador to Zimbabwe. Note: Mr. 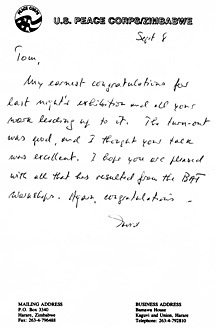 Chambers extended his Service for a third year to complete the Permanent Collection Project to produce the Catalogue. As a Secondary Project, Mr. Chambers initiated and then served as the Instructor for The McEwen Photographic Studio. The namesake was selected as a tribute to Frank McEwen, the first Director of the National Gallery (1957-1973), and in recognition of his Workshop School activities for African artists during the 1950s and 1960s. The McEwen Photographic Studio has now become an integral part of the National Gallery Art School curriculum, and provides African art students an opportunity to experience the medium of photography as another tool for self-expression and vocational potential. Mr. Chambers taught this seven-month photographic workshop each year (1993, 1994 and 1995) of his Peace Corps Service, and the process culminated in an annual exhibition at the National Gallery, respectively: Moments In Time (1993); Moments In Time II (1994); and Moments In Time III (1995). The United States Ambassador to Zimbabwe officially opened the first two exhibitions; the Country Director of Peace Corps Zimbabwe officially opened the last one; and the United States Peace Corps was a partial sponsor of all three openings. Mr. Chambers also succeeded in obtaining funding to support the photographic workshop process including Kodak Zimbabwe Ltd. (materials grants totaling US$3000.00), Caltex Oil Zimbabwe Ltd. (US$1000.00), Johnson and Johnson Zimbabwe Ltd. (US$400.00), Randalls Holdings (Pvt.) Ltd. (US$150.00), Meikles Consolidated Holdings (Pvt.) Ltd. (US$250.00), BAT Zimbabwe Ltd. (US$200.00) and Crown Cork Company Ltd. (US$60.00) - total: US$5060.00. As a Tertiary Project, Mr. Chambers initiated, and advised SKIA (Street Kids In Action), a youth development program for at-risk youth in the urban areas (particularly, Harare) of Zimbabwe. He succeeded in bringing together, and motivating numerous individuals from the Zimbabwean community to move SKIA forward, at grass-roots level, as a Zimbabwean-based program to address the Street Kids issue in an all-encompassing manner. Specifically, a small university approach is planned, in which street children and young adults can benefit from basic education classes, arts/vocational workshops, counseling, athletics and maintenance (Half-Way House approach for the truly destitute); the children are re-integrated in the Public Education system, reunited with the family unit, and placed with corporations/organizations as trainees/assistants/interns to offer them co-operative opportunities. The program has created a greater awareness of the Street Kids issue, and raised local funds (US$35000.00 - Charity Casinos, Mayoral Fund, Rotaract Clubs, corporations, fundraising events, individuals and memberships) to purchase a facility to implement its small university approach, and hire a Zimbabwean Project Manager. Mr. 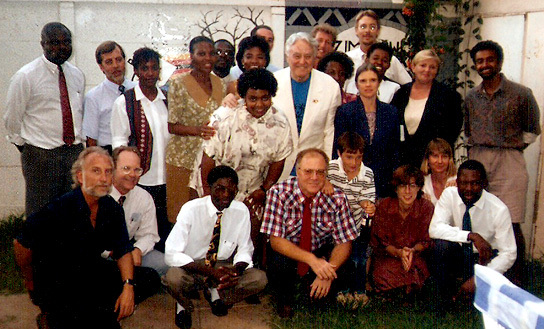 Chambers attended the United States Peace Corps Africa region Small Business Development and Youth Development Conference in Gaborone, Botswana (September 19-23, 1994) in connection with this program. In this same Advisor/Counselor role, he also provided guidance and assistance to a number of individuals and organizations seeking help and practical guidance in urban youth programs as far away as Kenya (where he made presentations to PCVs), Botswana and Ghana. Mr. 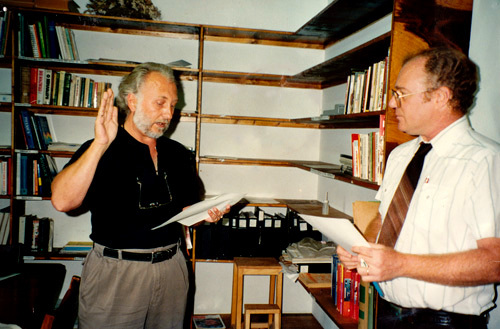 Chambers also served as a Project Adviser for American students who traveled to Zimbabwe on Study-Abroad programs through Scripps-Pitzer/University of Zimbabwe and School for International Training (He advised seven students in various cross-cultural projects.). In addition, as a Documentary Photographer, he generated a series of photographs (portraits/landscapes of Africans and their lifestyles in a rural area of Zimbabwe, Southwest of Rusape: The Mucharambeyi Connection), and received a US Government grant (US$400.00) through the United States Information Service (USIS) to exhibit this series at the USIS Library in Harare, Zimbabwe (June, 1995). The U.S. Ambassador to Zimbabwe officially opened this exhibition. 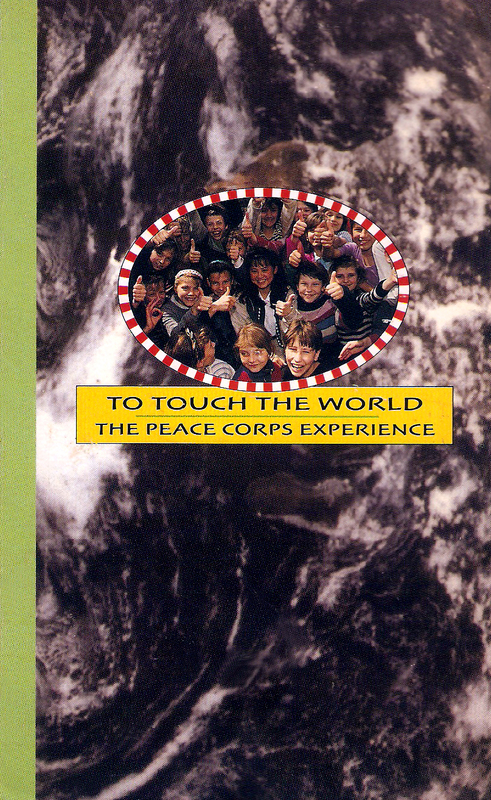 Pursuant to section 5 (f) of the Peace Corps Act, 22 U.S.C. 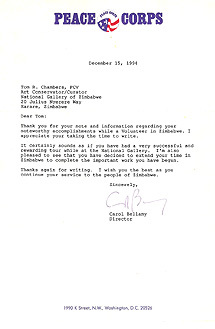 2504 (f) as amended, any former Volunteer employed by the United States Government following his/her Peace Corps Volunteer Service is entitled to have any period of satisfactory Peace Corps Volunteer Service credited for purposes of retirement, seniority, reduction in force, leave and other privileges based on length of Government service. Peace Corps Service shall not be credited toward completion of the probationary or trail period or completion of any service requirement for career appointment. This is to certify in accordance with Executive Order No. 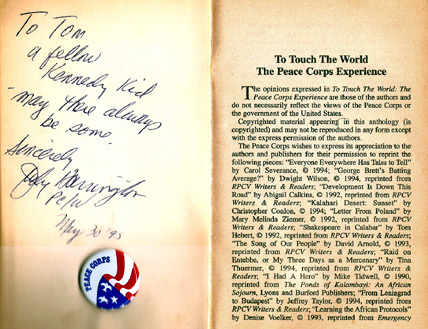 11103 of April 10, 1963 that Tommy R. Chambers served satisfactorily as a Peace Corps Volunteer. His service ended on December 31, 1995. He is therefore eligible to be appointed as a career-conditional employee in the competitive Civil Service on a non-competitive basis. This benefit under the Executive Order entitlement extends for a period of one year, except that the employing agency may extend the period for up to three years for a former Volunteer who enters military service, pursues studies at a recognized institution of higher learning, or engages in other activities which in view of the appointing authority warrants extension of the period. Chambers being sworn in as a United States Peace Corps Volunteer by David Bellama, Country Director, Zimbabwe. Sargent Shriver (first director of the Peace Corps) (center - white jacket) and Zimbabwe Volunteers and staff. Tom R. Chambers and Sargent Shriver. 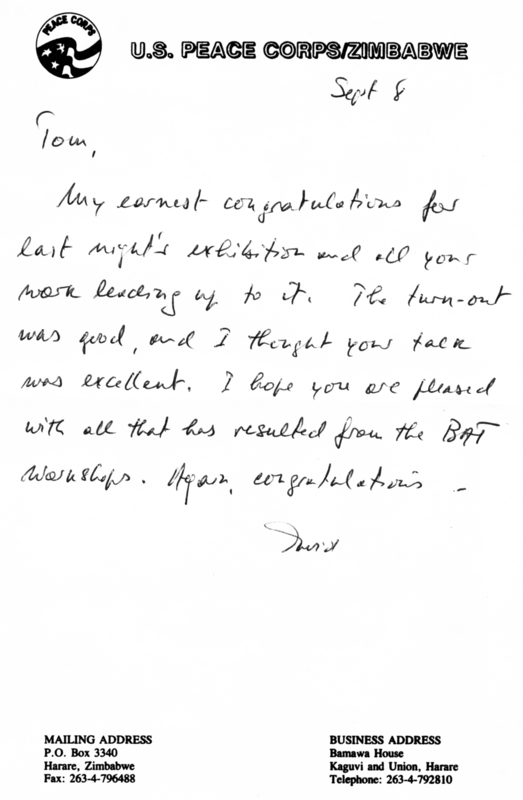 Reference Letter from the Country Director.